Happy Monday you guys! I know a lot of you will probably scoff when I say this, but I actually love Mondays! They always mean good things like fresh starts, new schedules, and they are my favorite days to open giveaways, make announcements, or start a new series on my blog! and you know what? Today I am doing just that. I'm starting a little mini hairstyle series, and I'm calling it Holiday Hair Week because I am going to take the next seven days to bring you 7 quick, glamorous, party-perfect hairstyles! Soirée season can often cause a lot of anxiety, but in my book it can also inspire adventurous hair:) I hope that this week of styles will inspire you to step out of your comfort zone, and stop telling yourself that you don't know how to do hair, or that don't have the time to put a little effort into your hair because for one I'm teaching you and for two, it only takes a few minutes Your hair is the best accessory you wear, so why not make it fabulous? Especially at a party or event! Step #1: Choose a dramatic side part to start off, and smooth the top half of your hair back into a ponytail at the back of your head and secure tightly with a hair tie. Pull the rest of your hait into a ponytail close to the first. 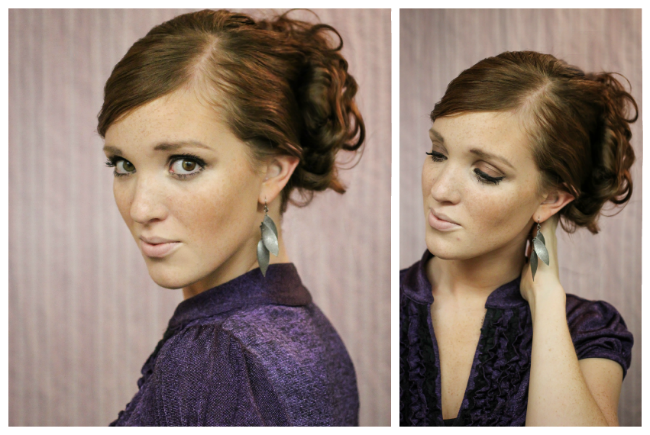 Step #2: Taking a small section of hair, begin to twist it up. Holding the very end of your twist tightly in one hand, tug carefully on the rest of your twist and pull upwards creating a secure clump of loopy hair, which you will secure tightly to your head with 1 bobby pin. Step #3: repeat the process in step 2 with both your ponytails I did about 12 total), making sure to check in a two way mirror and secure up any flyaways that may be loose. tug gently at various parts of your hair a bit here and there to create more volume, and give it some good hairspray girl! Come back every day this week for a variety of new styles, because there will undoubtedly be one perfect to match that particular dress, or that pair of heels:) Whether you're dressing up for an after-work cocktail party or an all-out black tie affair, you'll find the perfect holiday hair style in this series. Can't wait to hear what you think! Thanks so much for visiting today, and I hope you come back tomorrow for the next tutorial! Beautiful hair style. You look stunning in that shade of purple! love the idea on the series! Lord knows i need ideas on hairstyles. loving this one. stunning look! i will definitely have to try this! You are gorgeous by the way! 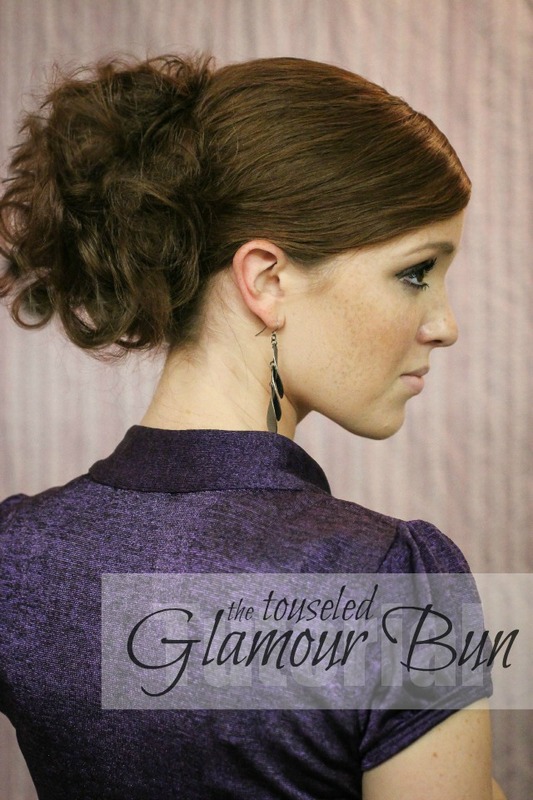 I'll have to try this hairstyle out! You are stunning! Your hairstyles are so pretty! I'm hopeless with every kind of hairstyle! Wow this looks gorgeous, I think I need you to do my hair for me lol, xoxo. hi dear, thanks for your lovely comment on my blog!